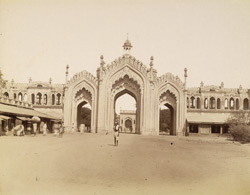 Hosainabad Gate & Bazaar, Lucknow. bl.uk > Online Gallery Home	> Online exhibitions	> Asia, Pacific and Africa Collections	> Hosainabad Gate & Bazaar, Lucknow. Photograph with a view of Hussainabad Darwaza at Lucknow in Uttar Pradesh, taken by an unknown photographer in the 1880s, part of the Bellew Collection of Architectural Views. Lucknow on the Gomti river first attained prominence in the 15th century under the Sharqi sultans of Jaunpur. Later it was ruled by Mughal governors. By the 17th century it was a prosperous commercial centre, and continued to flourish from 1775-1856 as the capital of the independent Nawabs of Avadh (originally governors under the Mughals). The nawabs were great builders and patrons of the arts and attracted a variety of talent to their service which helped develop the city's culture. The Nawabs commissioned numerous imposing Darwazas or gateways; the Hussainabad Imambara area in Lucknow has many gateways dating from the reign of Nawab Muhammad Ali Shah (c.1837-42), including this theatrical one with its three arched entrances.